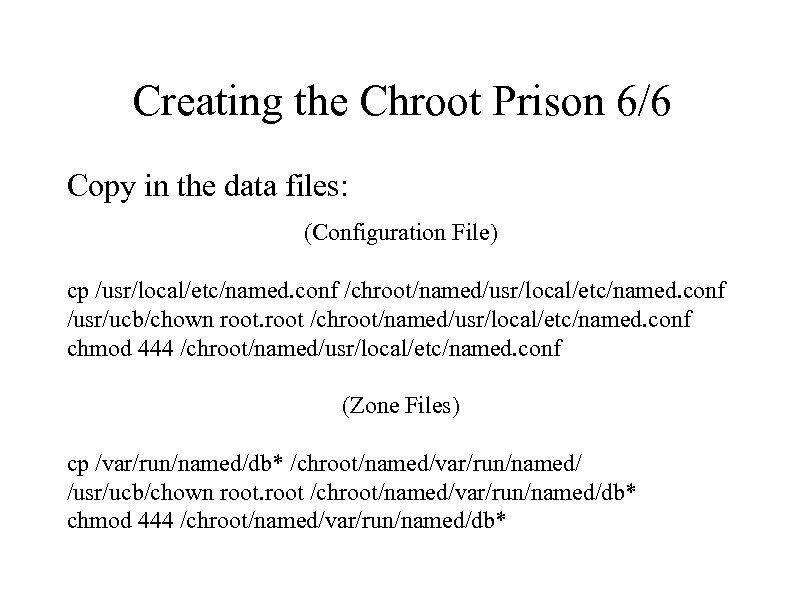 Running Secure DNS Servers " " " Installing and configuring Unix BIND DNS server Simulating attacks and information probes for security assurance Implementing security "best practices" for DNS configuration Advanced Methods: Chroot the Daemon, Run as Non-superuser Split Horizon? 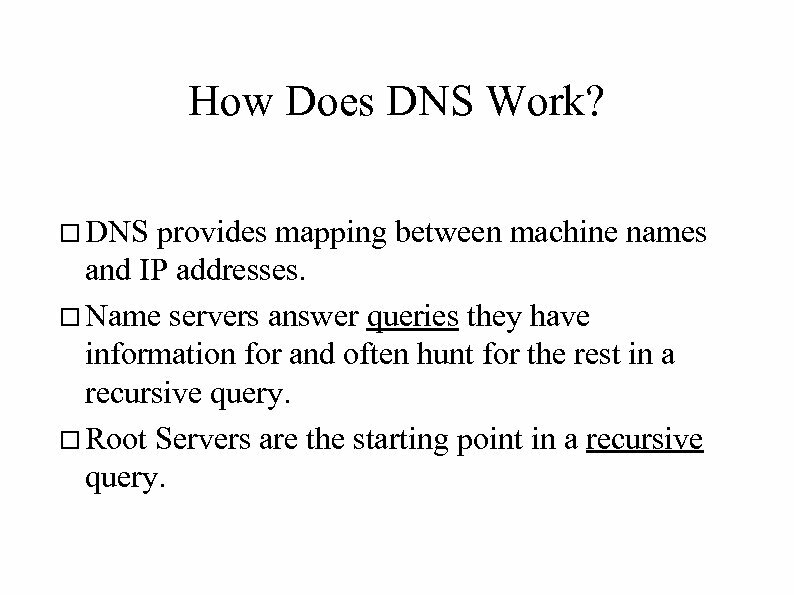 How Does DNS Work? DNS provides mapping between machine names and IP addresses. 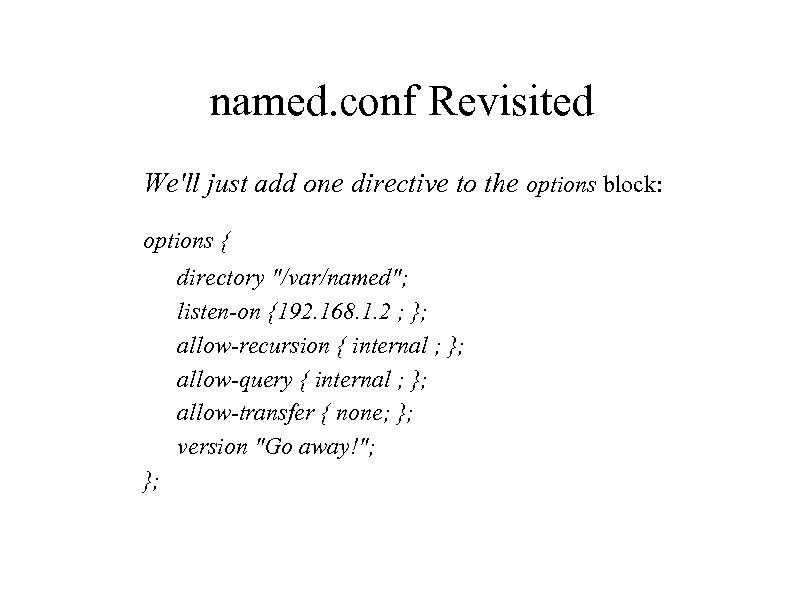 Name servers answer queries they have information for and often hunt for the rest in a recursive query. 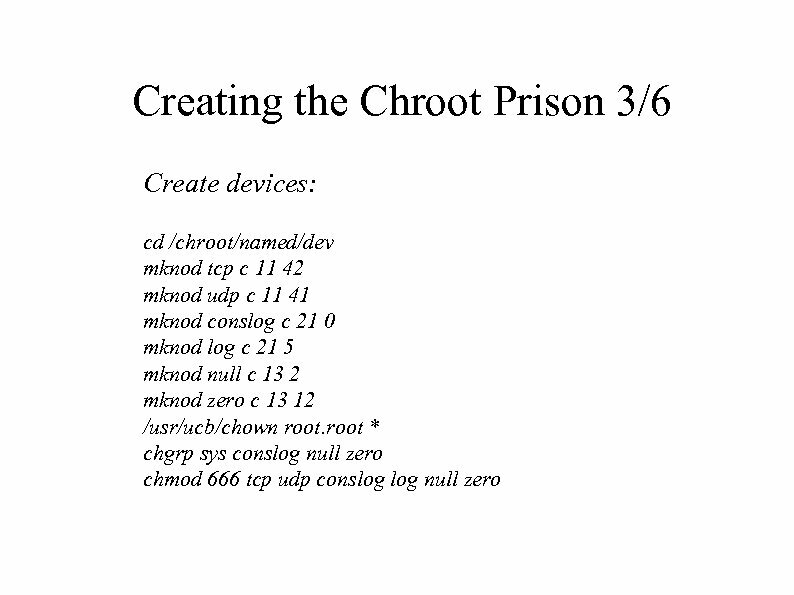 Root Servers are the starting point in a recursive query. 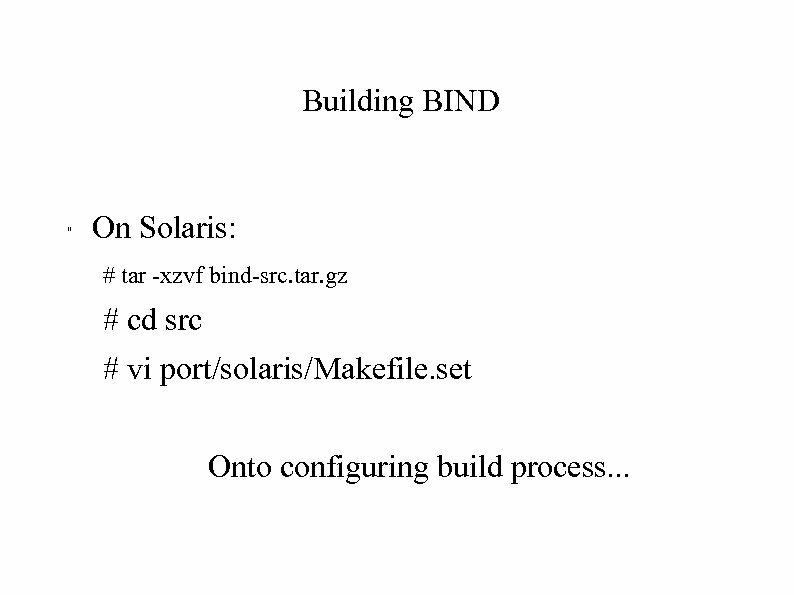 Building BIND " On Solaris: # tar -xzvf bind-src. tar. 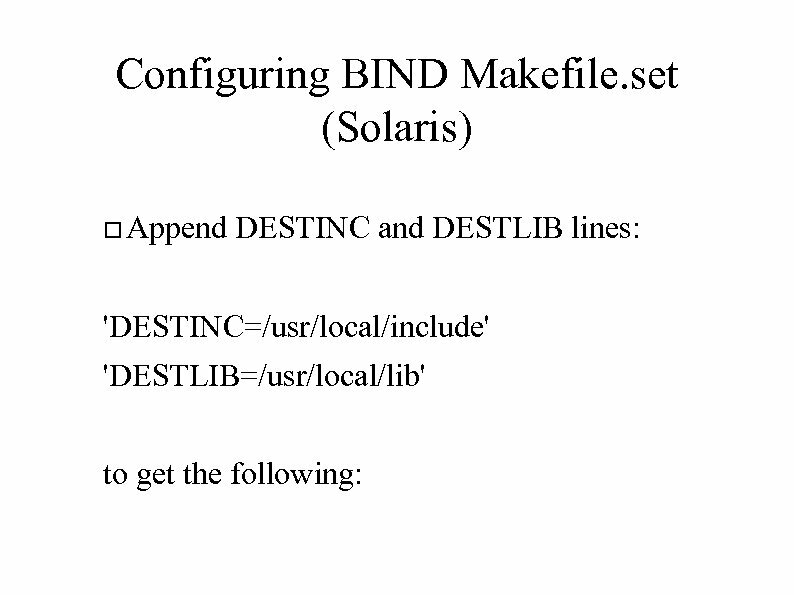 gz # cd src # vi port/solaris/Makefile. 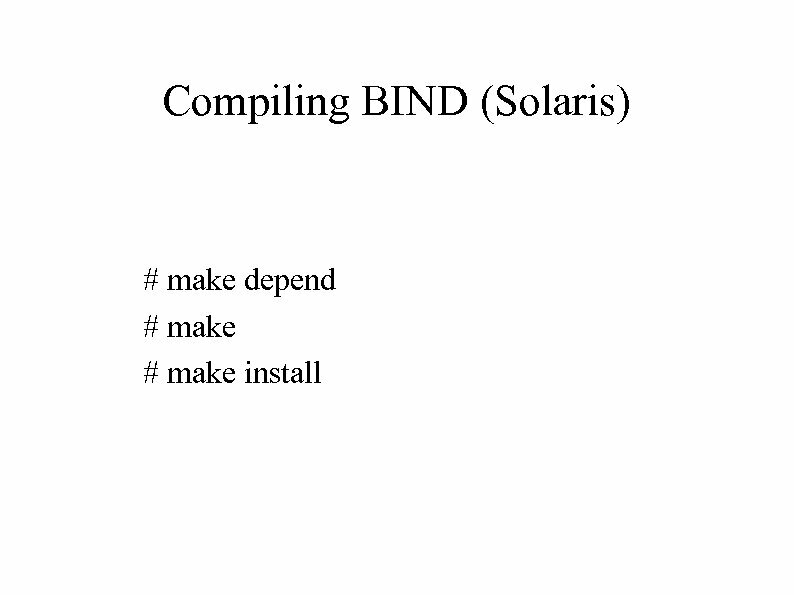 set Onto configuring build process. 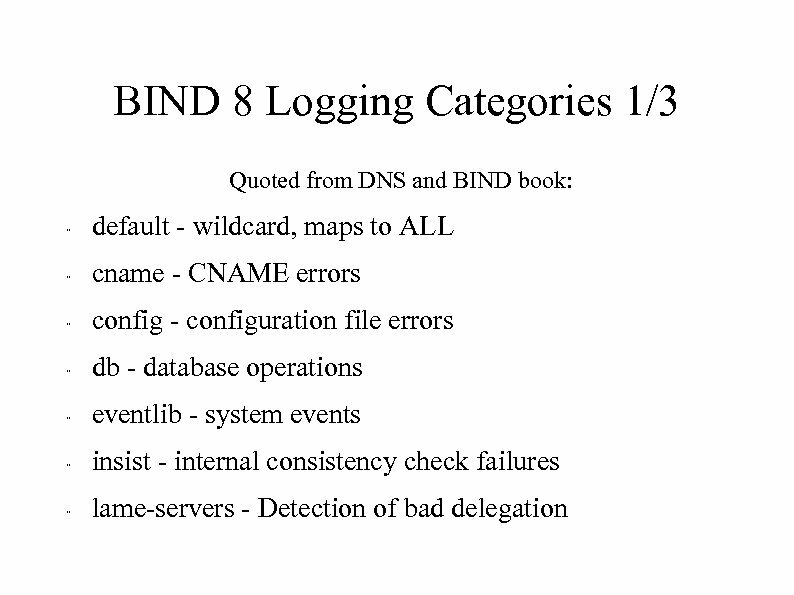 . .
Configuring BIND " BIND 8 and 9, unlike BIND 4, use named. conf. 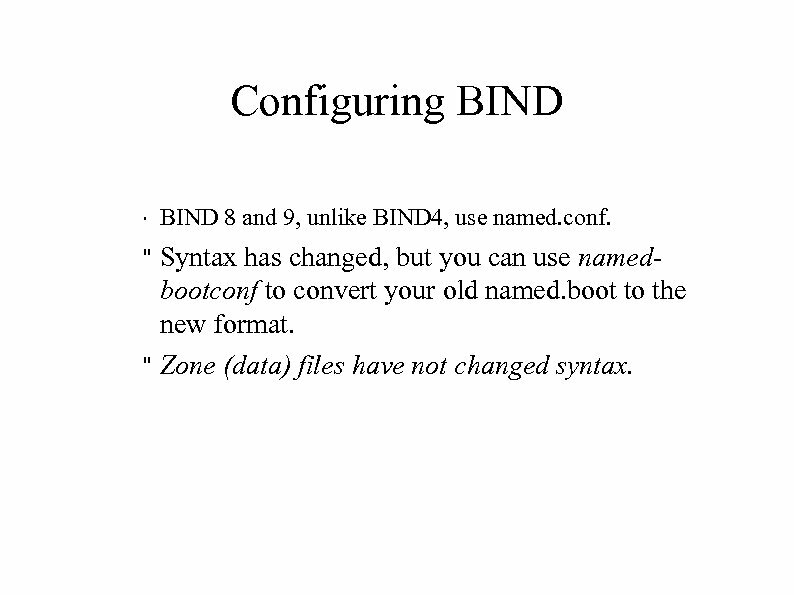 Syntax has changed, but you can use namedbootconf to convert your old named. boot to the new format. " 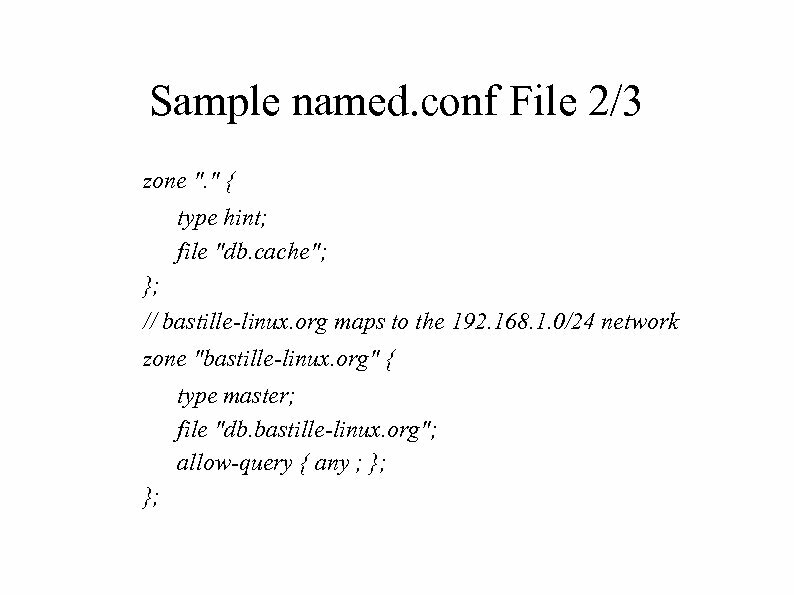 Zone (data) files have not changed syntax. " 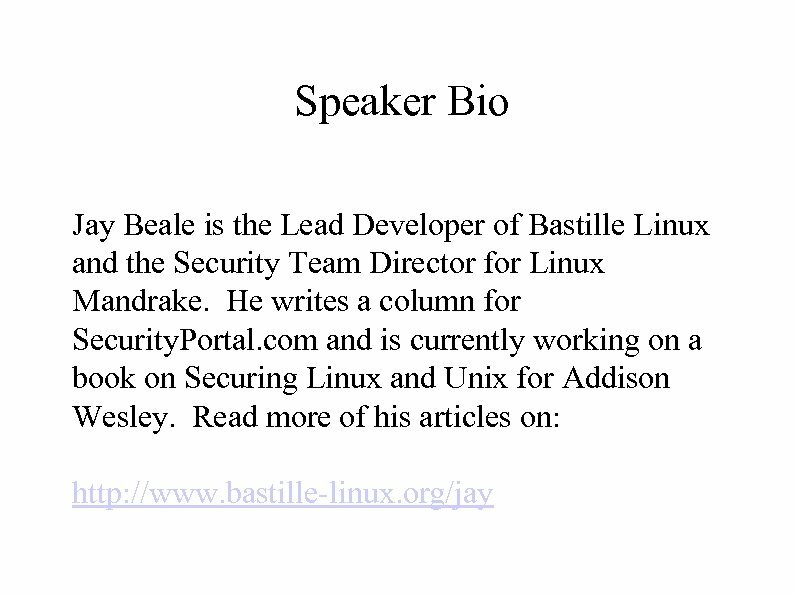 Interesting Part of the Talk " Take the role of an attacker! 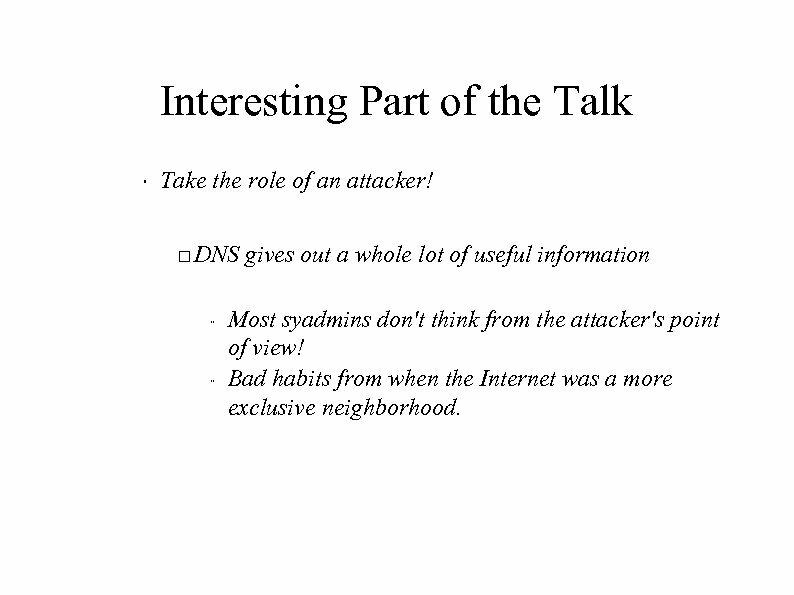 DNS gives out a whole lot of useful information " " Most syadmins don't think from the attacker's point of view! Bad habits from when the Internet was a more exclusive neighborhood. Reactions? Two commands and we have a full dump of their zone data! Hey, check out that TXT record! Which host appears to be the Sys. Admin's workstation? Will other machines potentially trust this one more? Maybe they all trust it for rsh-based backups even? !!!! Reactions? 2/2 Check out the HINFO records! 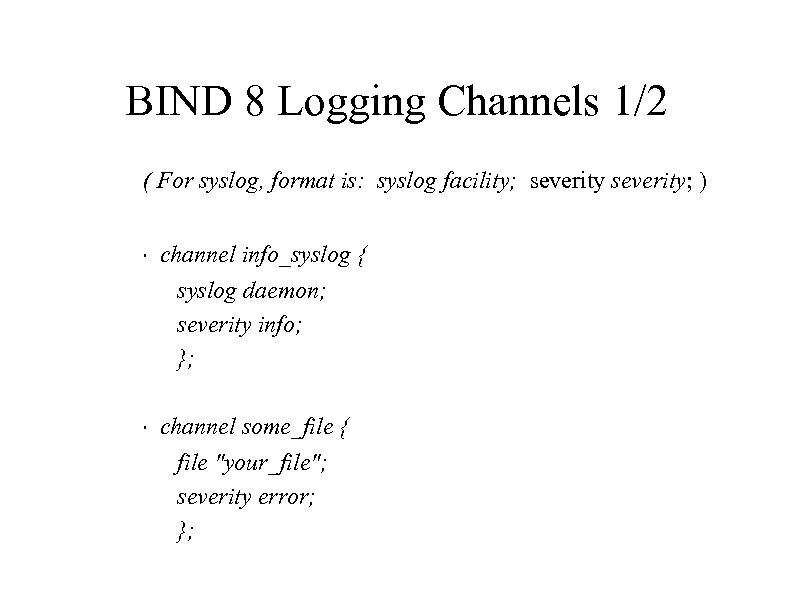 I note the Sys. Admin's trusted box, running Red Hat 6. 1. 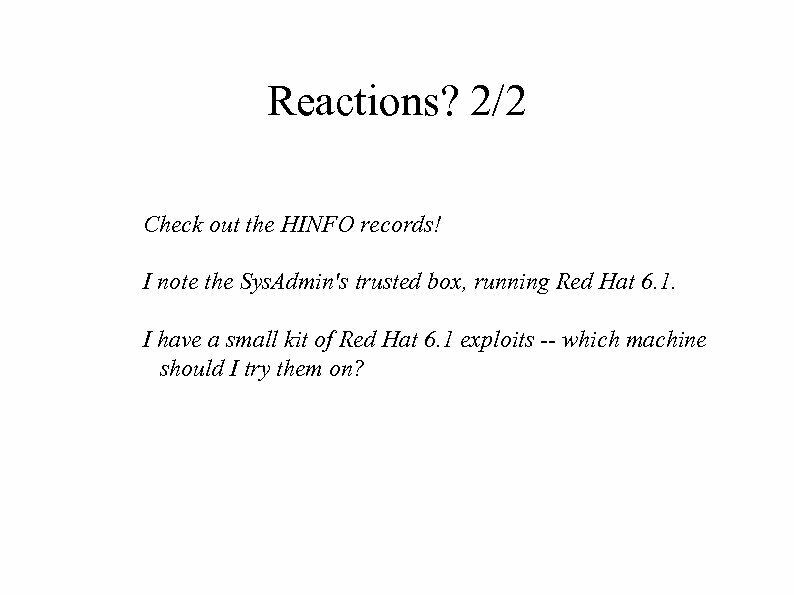 I have a small kit of Red Hat 6. 1 exploits -- which machine should I try them on? 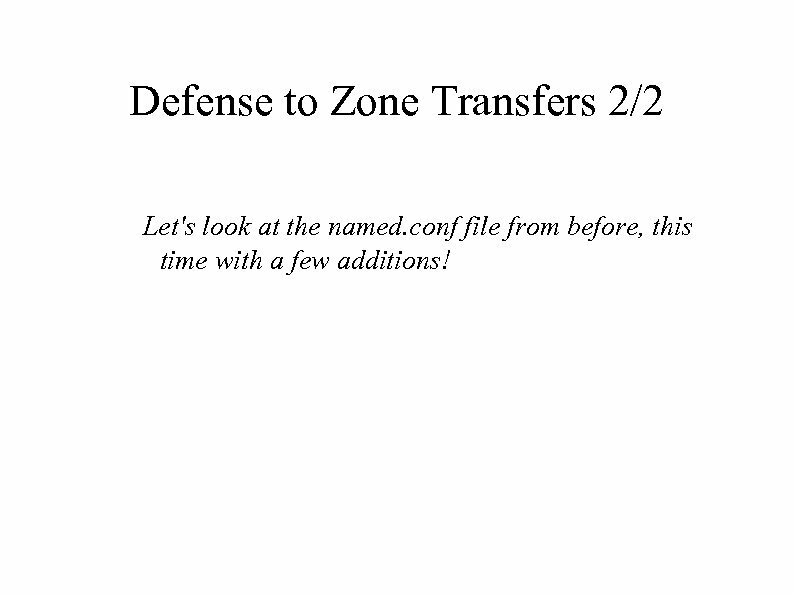 Defense to Zone Transfers 2/2 Let's look at the named. conf file from before, this time with a few additions! 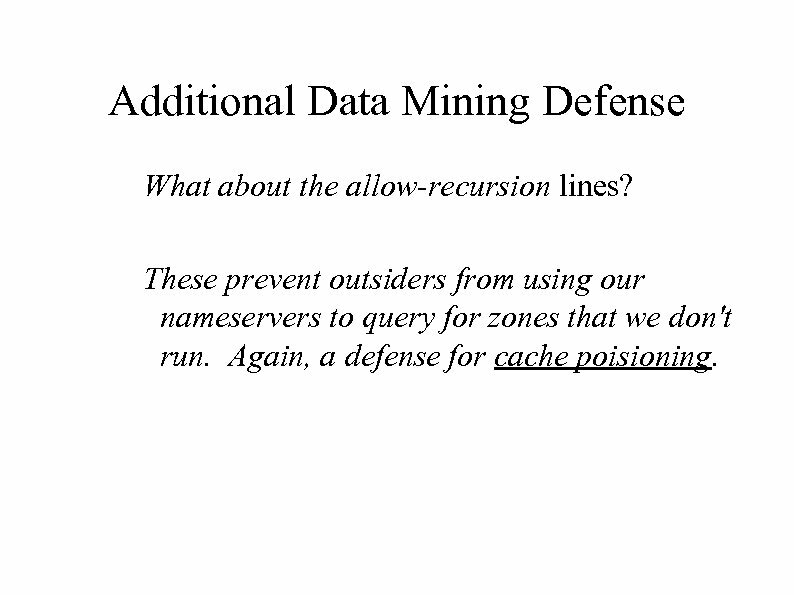 Additional Data Mining Defense Notice those allow-query lines? 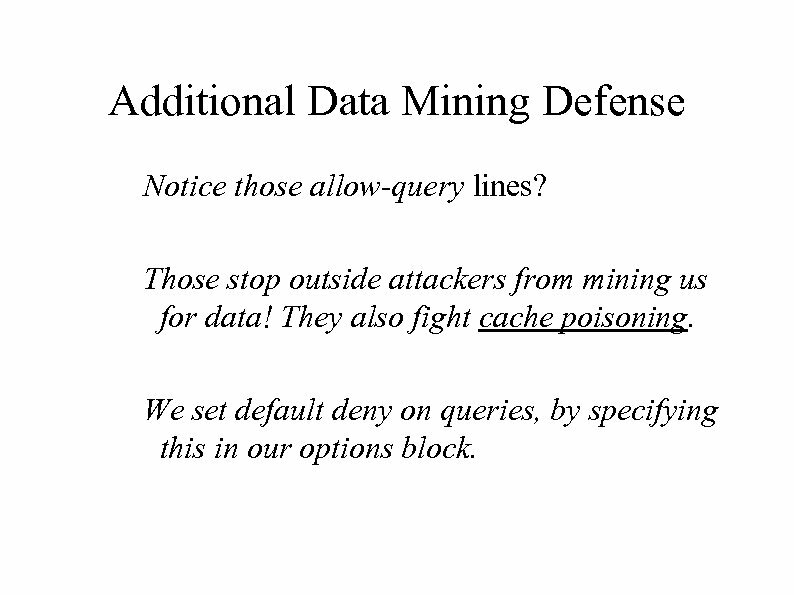 Those stop outside attackers from mining us for data! They also fight cache poisoning. We set default deny on queries, by specifying this in our options block. 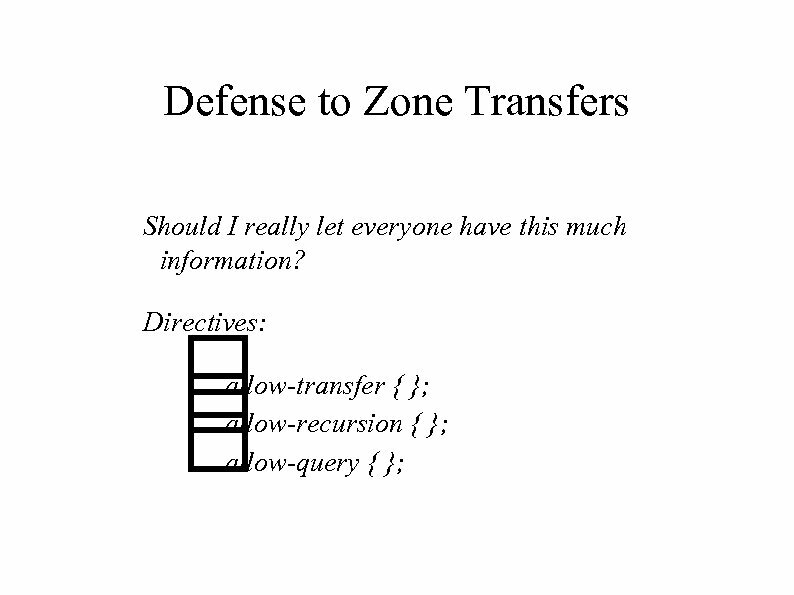 Additional Data Mining Defense What about the allow-recursion lines? 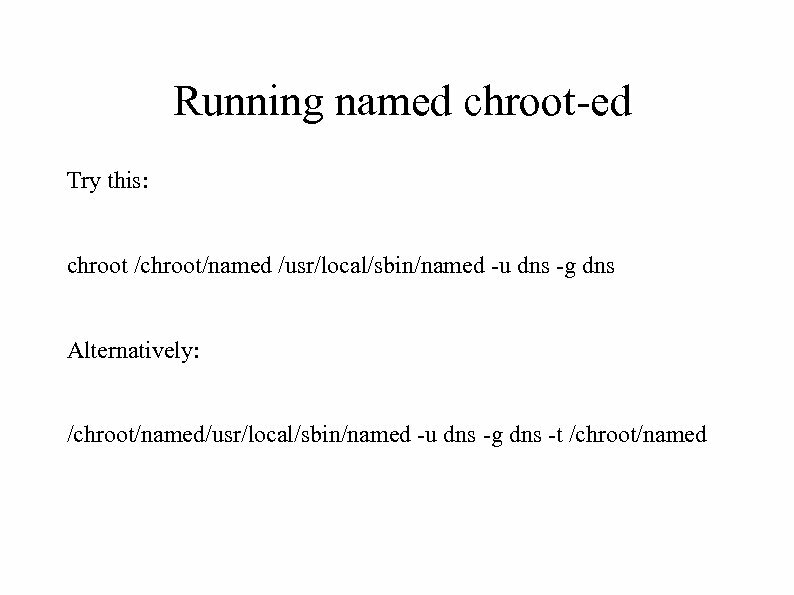 These prevent outsiders from using our nameservers to query for zones that we don't run. Again, a defense for cache poisioning. Cache Poisoning? By taking over an authoritative nameserver, an attacker obtains the ability to put data into our nameserver's cache. He accomplish this, if he can get us to ask his nameserver for information! Remember that DNS is a distributed database. The steps we're taking here attempt to minimize this possibility. The Simple Solution? Simple. Don't give away so much information! But how do we reconcile this with the need to keep easy online data about hosts? Two Choices 1) Remove all HINFO and TXT records. 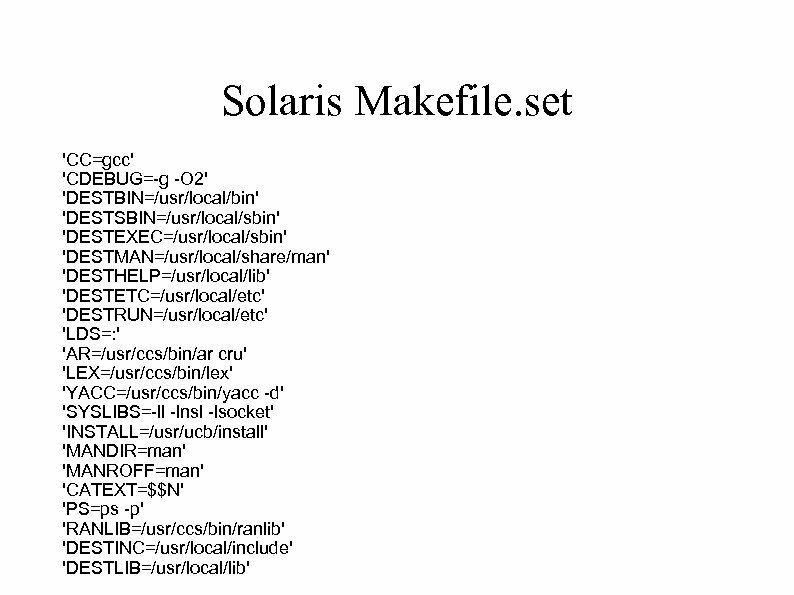 Consider choosing less informative machine names than sysadmin, printspool, and intranet. 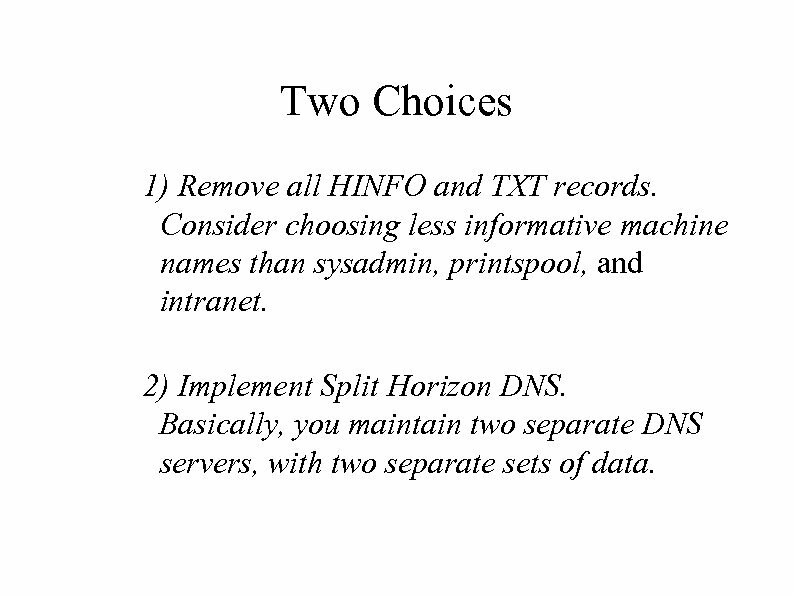 2) Implement Split Horizon DNS. 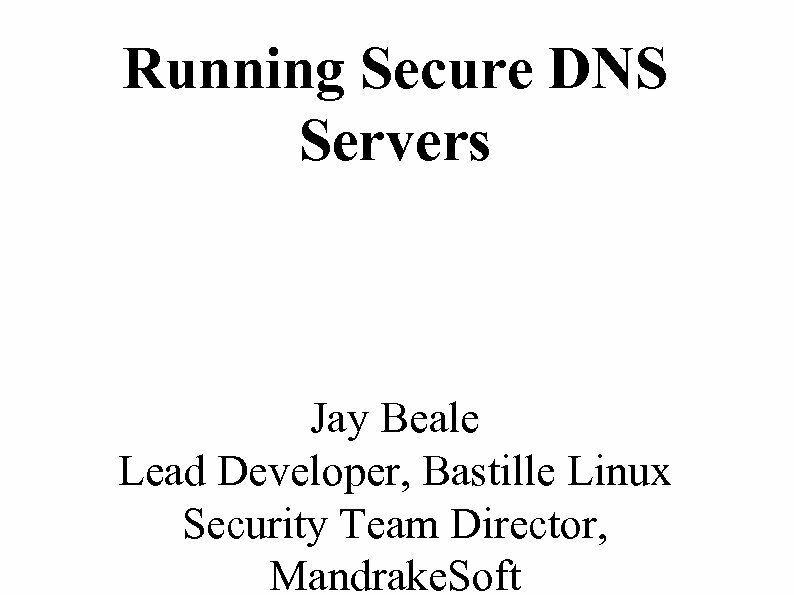 Basically, you maintain two separate DNS servers, with two separate sets of data. 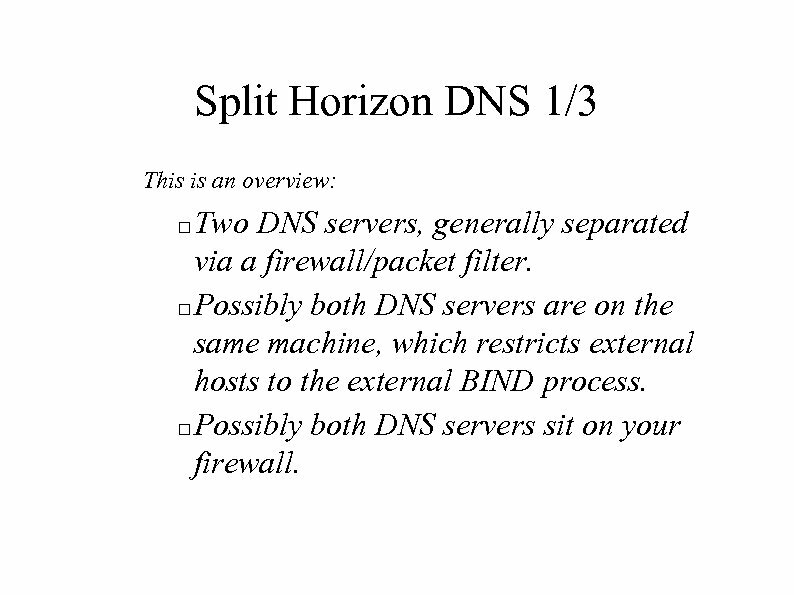 Split Horizon DNS 1/3 This is an overview: Two DNS servers, generally separated via a firewall/packet filter. 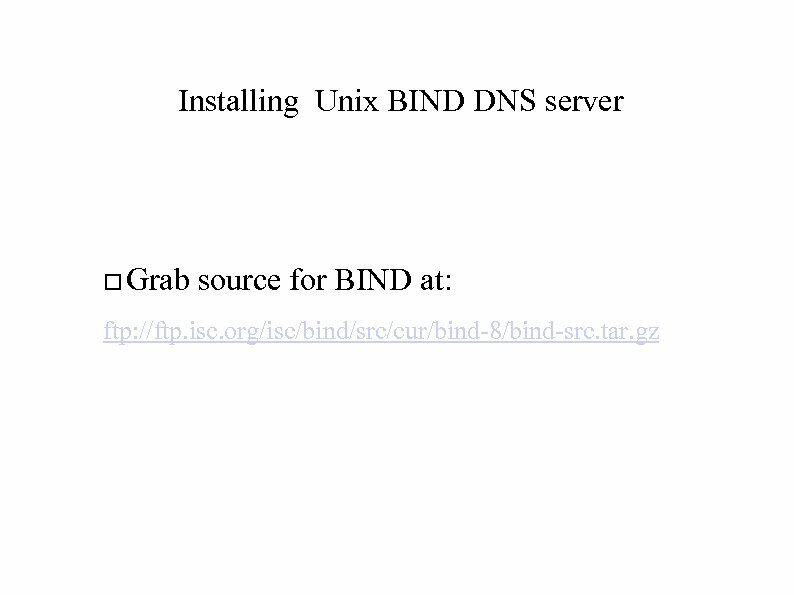 Possibly both DNS servers are on the same machine, which restricts external hosts to the external BIND process. Possibly both DNS servers sit on your firewall. Split Horizon DNS 2/3 Internal DNS Server: Only accepts requests from internal hosts. Possesses a richer zone database. Forwards all requests for external data to the external DNS server. No zone transfers, unless we have other internal DNS servers. Split Horizon DNS 3/3 External DNS Server: does recursion for internal hosts, usually Only only for internal DNS server. Possesses a sparser zone database. " Potentially much sparse, if used w/ NAT. transfers allowed from this host, but only Zone to the slave servers. Playing the Attacker Some More Cracking the DNS Server. . . 8. 2. 0 and 8. 2. 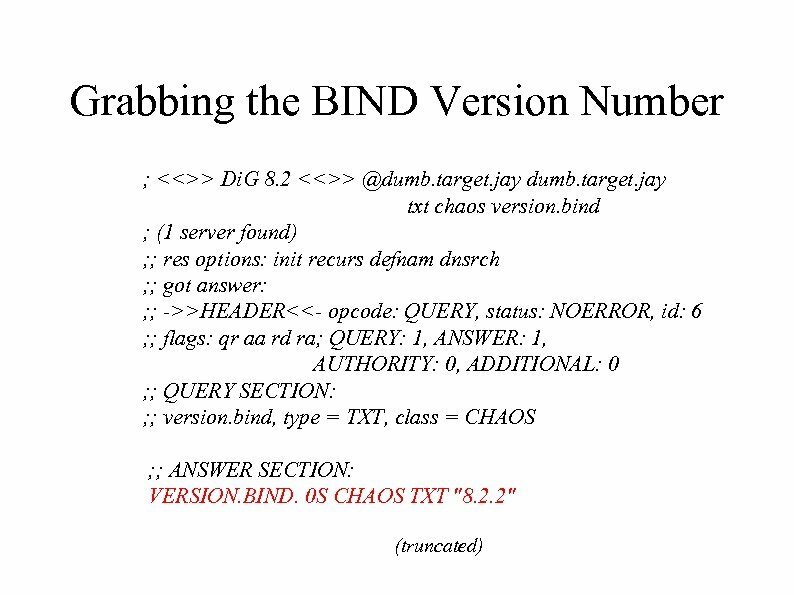 1 was vulnerable to a BIND Remote Root exploit! numbers of exploitable systems, when this Huge exploit was released. Red Hat 6. 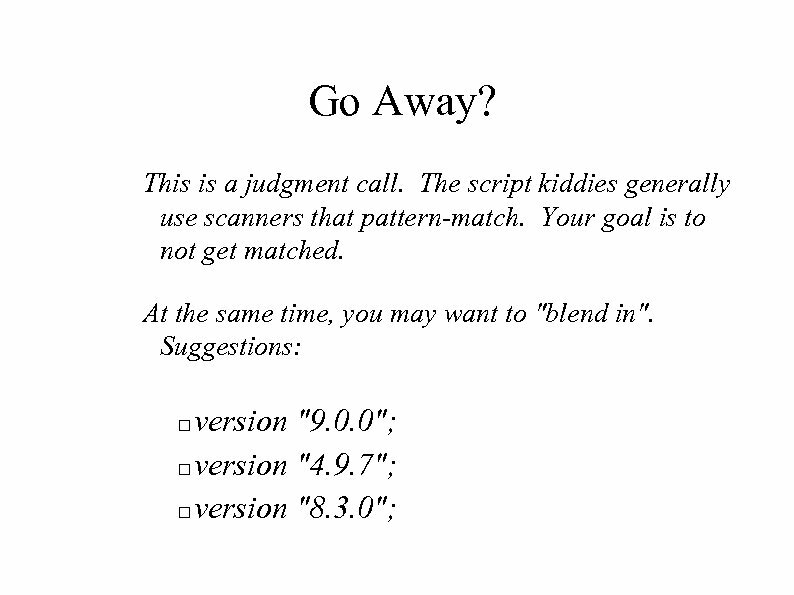 0, among many others, shipped with one of these versions. 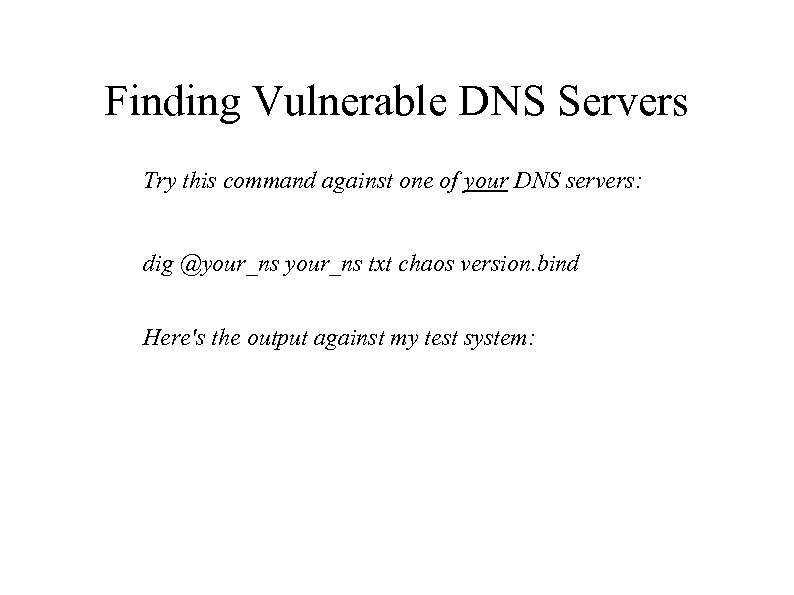 Cracking the DNS Server The Cracker HOW-TO is available here: http: //www. enteract. com/~lspitz/NXT-Howto. txt. But how does an attacker find vulnerable machines? Security through Obscurity? 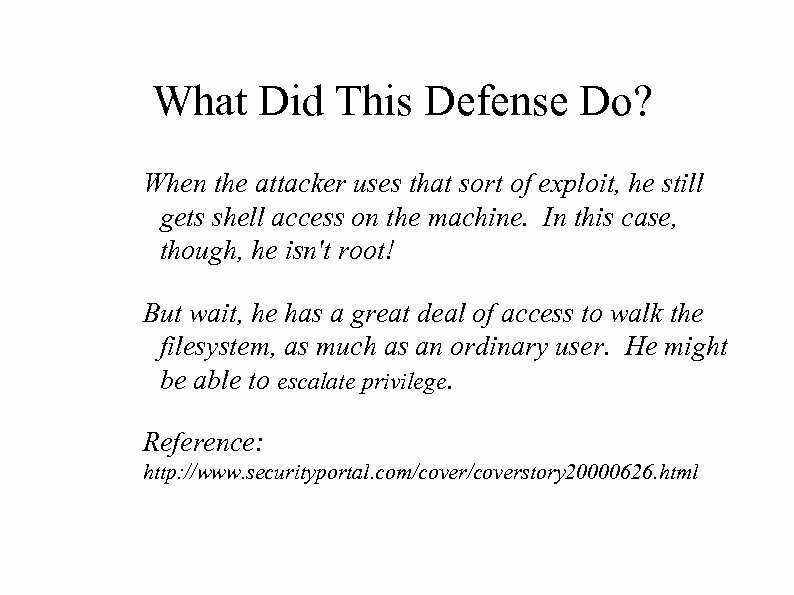 Security through Obscurity can be helpful, though it should never be your only defense. 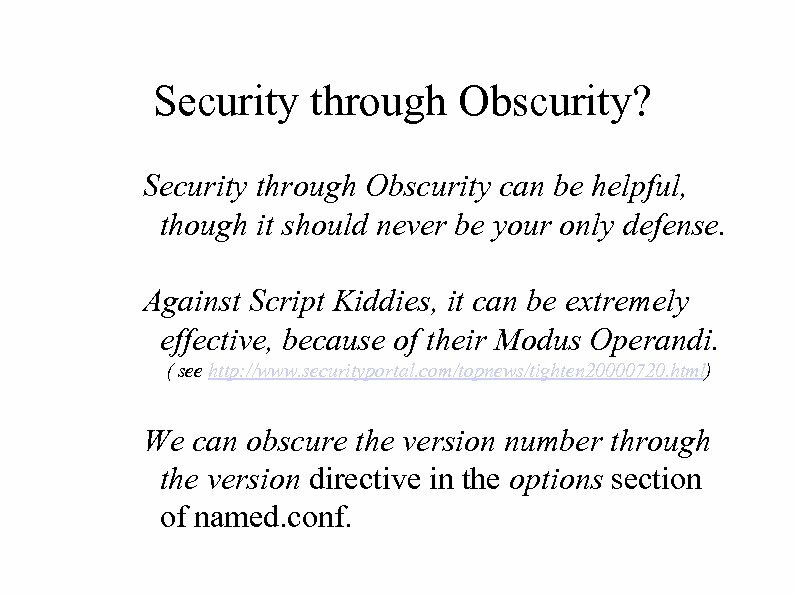 Against Script Kiddies, it can be extremely effective, because of their Modus Operandi. ( see http: //www. securityportal. com/topnews/tighten 20000720. html) We can obscure the version number through the version directive in the options section of named. conf. 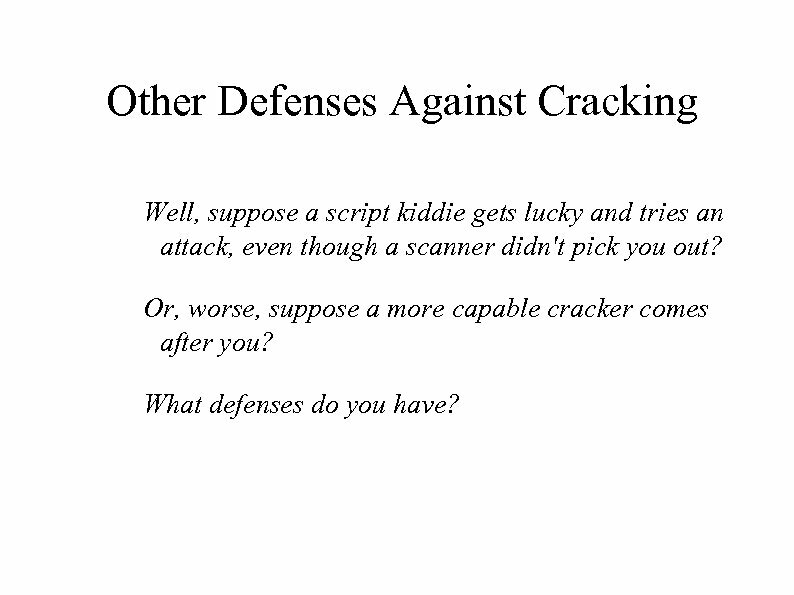 Other Defenses Against Cracking Well, suppose a script kiddie gets lucky and tries an attack, even though a scanner didn't pick you out? Or, worse, suppose a more capable cracker comes after you? What defenses do you have? Patch the Server! As boring as this is, it's wholly necessary! 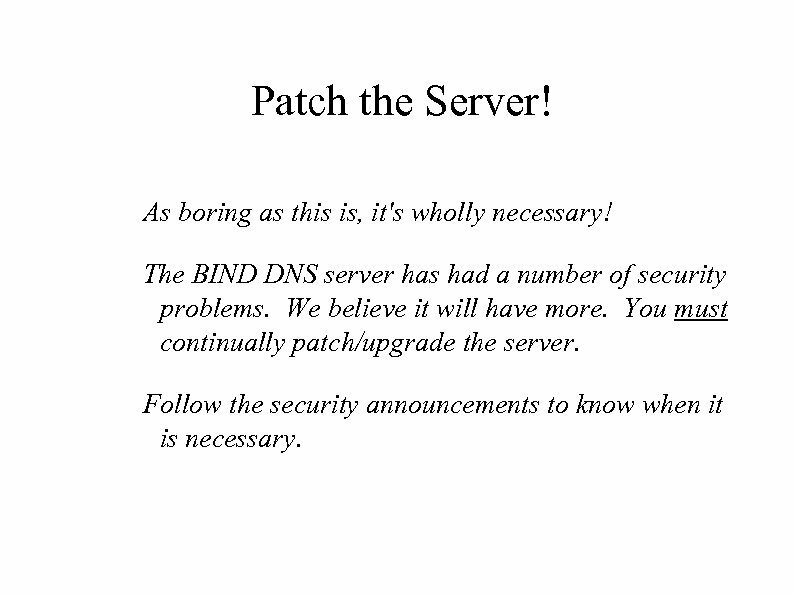 The BIND DNS server has had a number of security problems. We believe it will have more. You must continually patch/upgrade the server. Follow the security announcements to know when it is necessary. Remote Root Vulnerability Remember how we talked about a "remote root" vulnerability? You can't remove the "remote" part, but you can remove the "root" part in a very simple way: Don't run named as root! The attacker will get access as an ordinary user instead of superuser access! 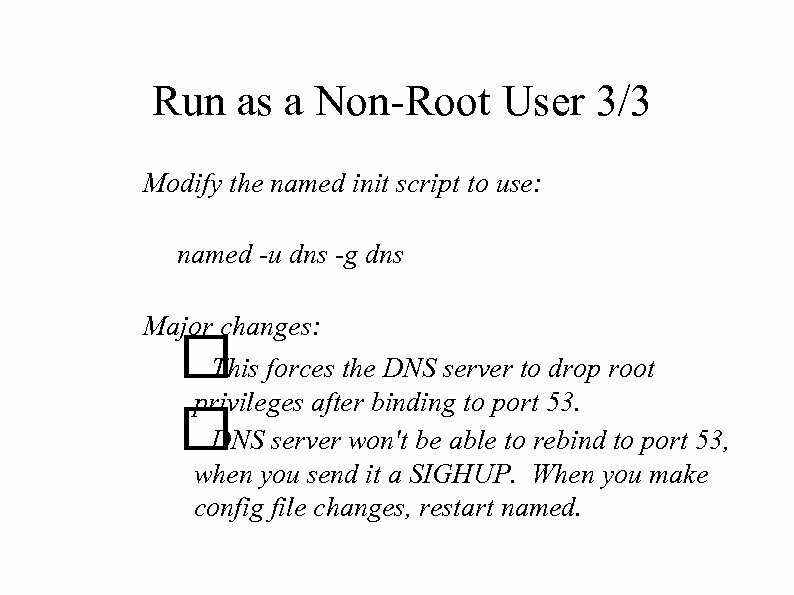 Run as a Non-Root User 3/3 Modify the named init script to use: named -u dns -g dns Major changes: This forces the DNS server to drop root privileges after binding to port 53. DNS server won't be able to rebind to port 53, when you send it a SIGHUP. When you make config file changes, restart named. 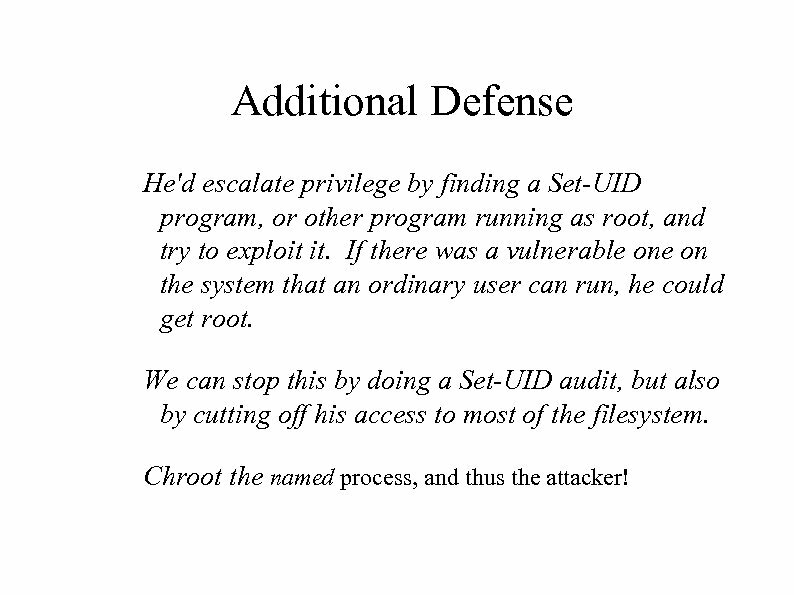 Additional Defense He'd escalate privilege by finding a Set-UID program, or other program running as root, and try to exploit it. 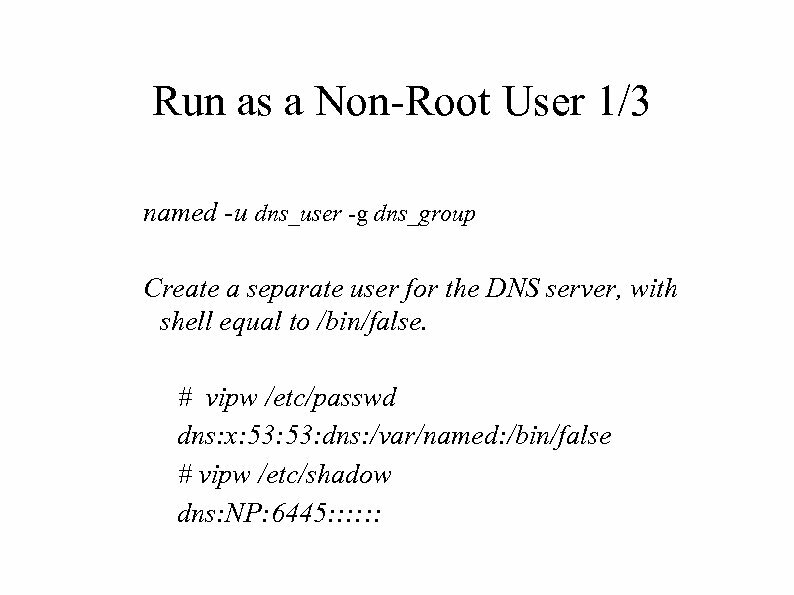 If there was a vulnerable on the system that an ordinary user can run, he could get root. 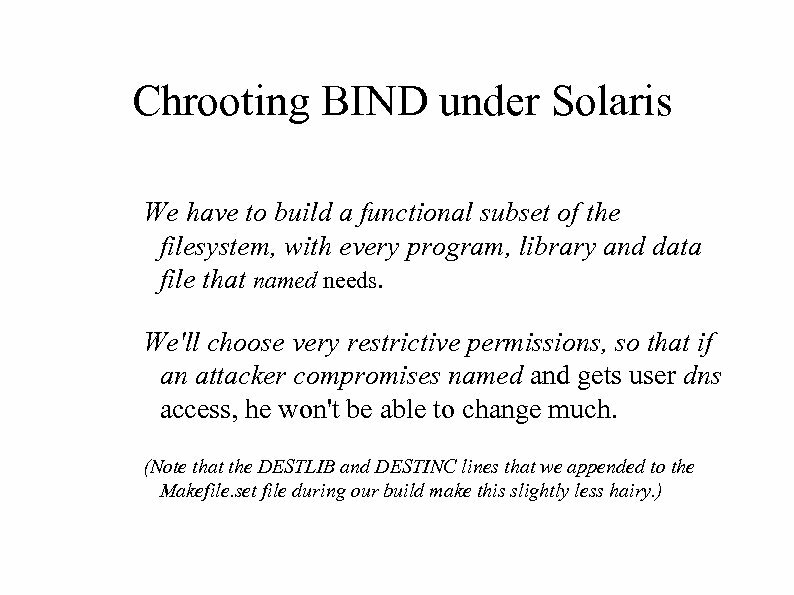 We can stop this by doing a Set-UID audit, but also by cutting off his access to most of the filesystem. 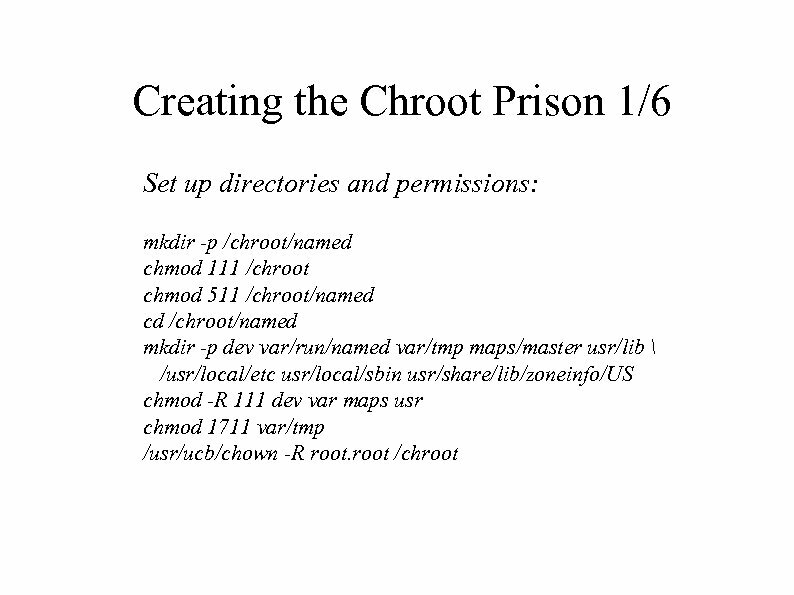 Chroot the named process, and thus the attacker! 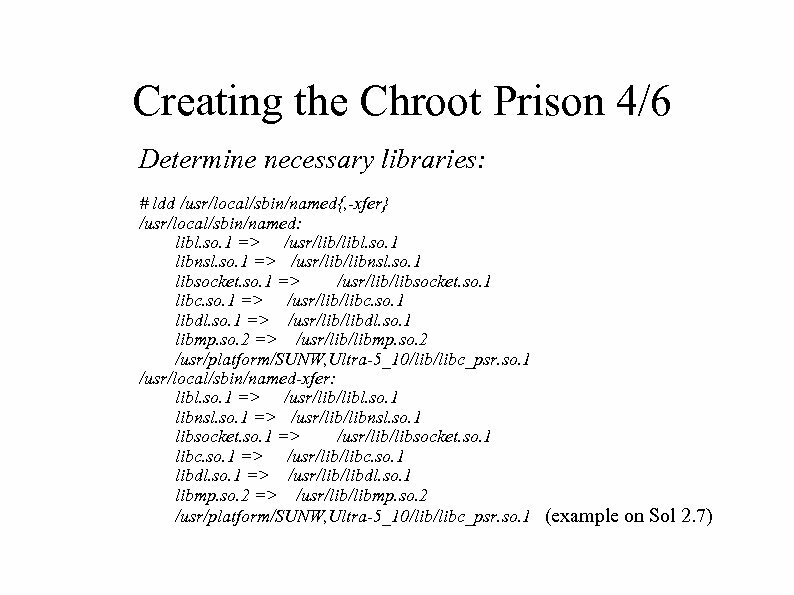 Chroot? 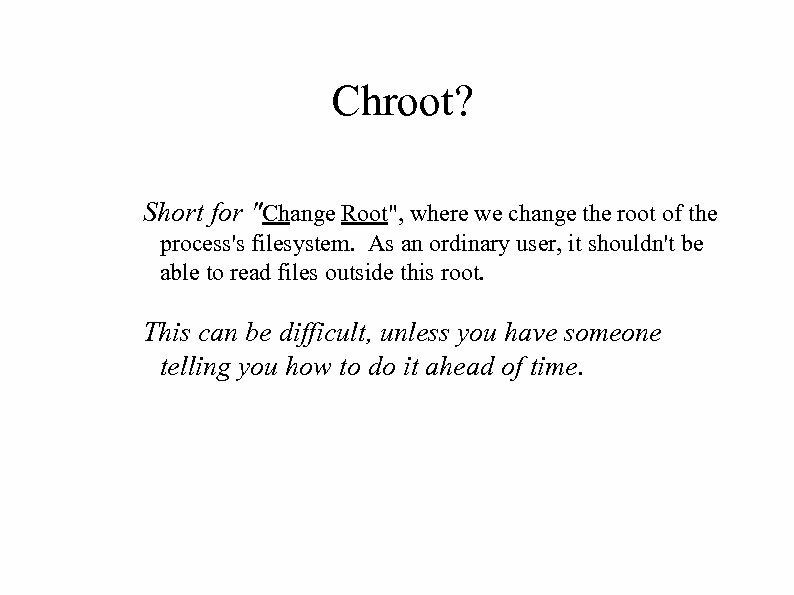 Short for "Change Root", where we change the root of the process's filesystem. As an ordinary user, it shouldn't be able to read files outside this root. This can be difficult, unless you have someone telling you how to do it ahead of time. 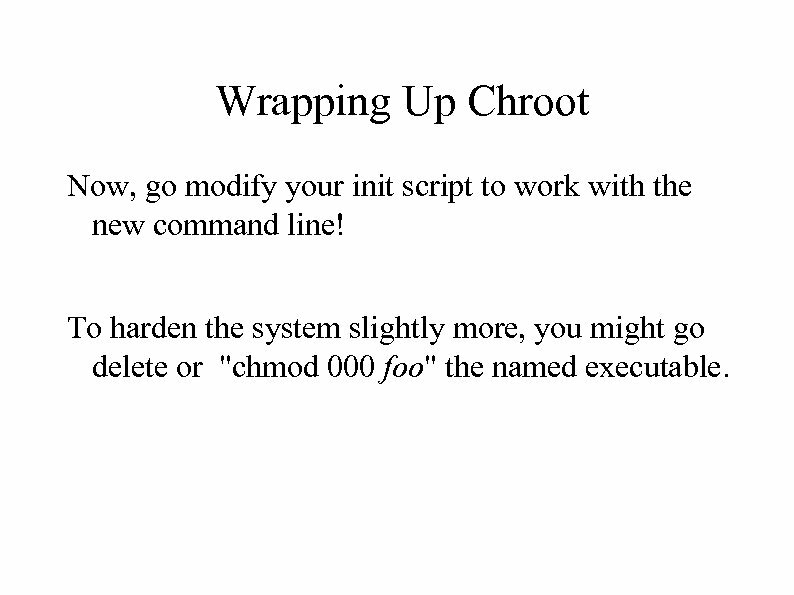 Wrapping Up Chroot Now, go modify your init script to work with the new command line! 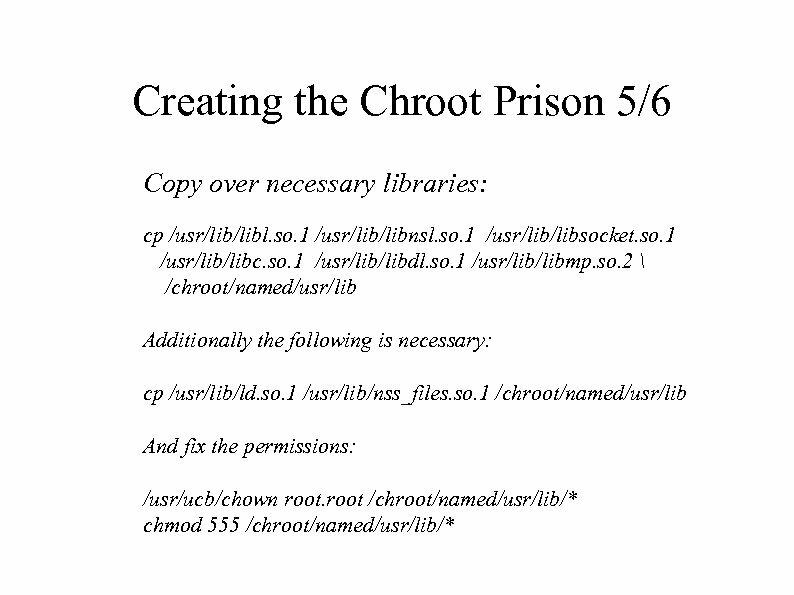 To harden the system slightly more, you might go delete or "chmod 000 foo" the named executable. 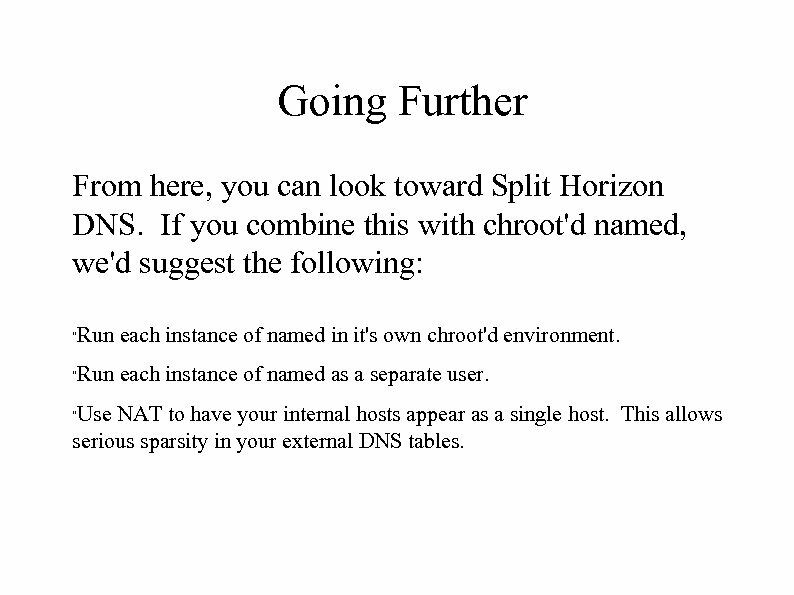 Going Further From here, you can look toward Split Horizon DNS. 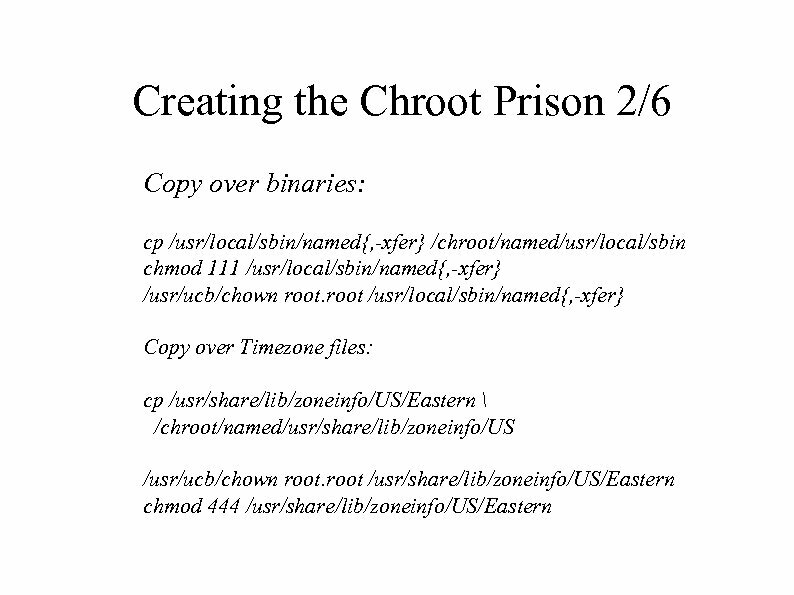 If you combine this with chroot'd named, we'd suggest the following: "Run each instance of named in it's own chroot'd environment. 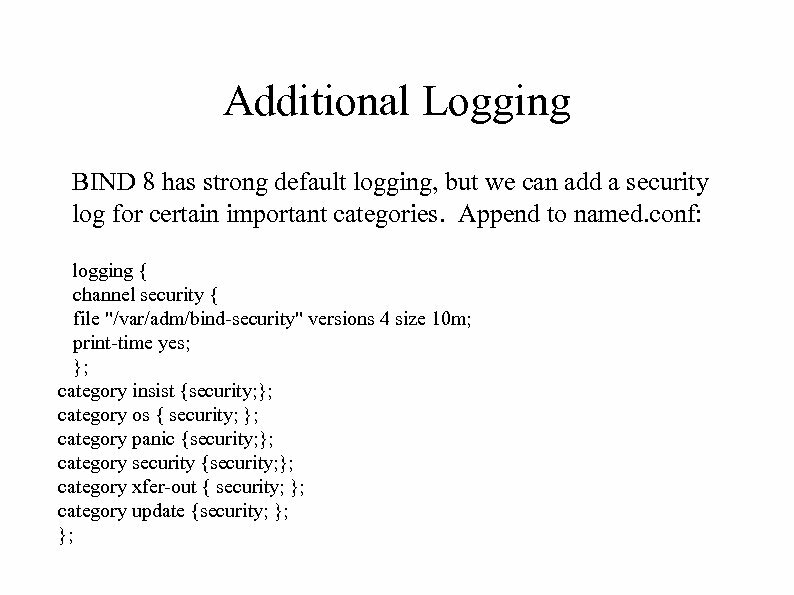 "Run each instance of named as a separate user. "Use NAT to have your internal hosts appear as a single host. This allows serious sparsity in your external DNS tables. 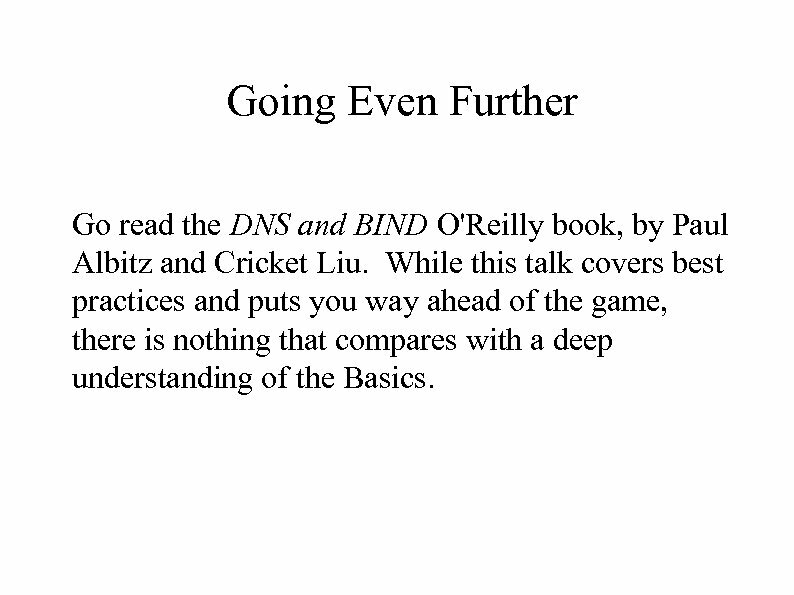 Going Even Further Go read the DNS and BIND O'Reilly book, by Paul Albitz and Cricket Liu. While this talk covers best practices and puts you way ahead of the game, there is nothing that compares with a deep understanding of the Basics. Off the Beaten Path. 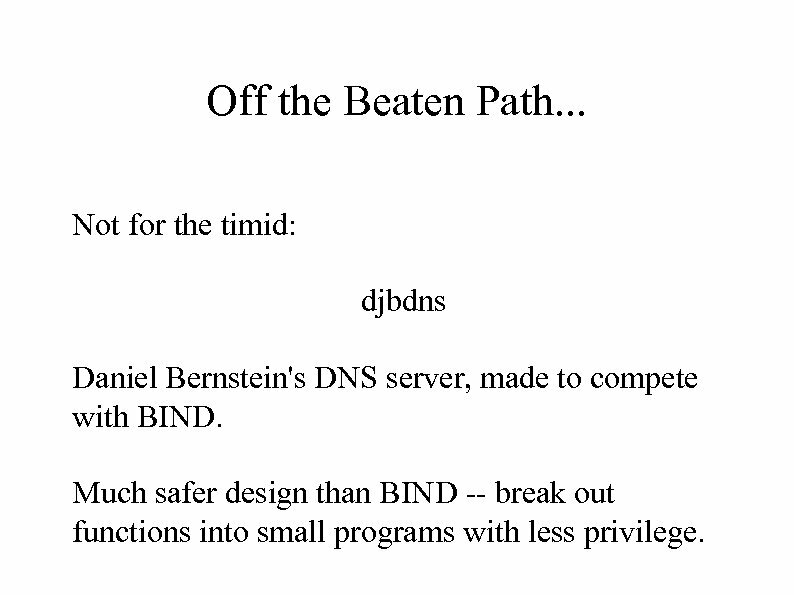 . . Not for the timid: djbdns Daniel Bernstein's DNS server, made to compete with BIND. 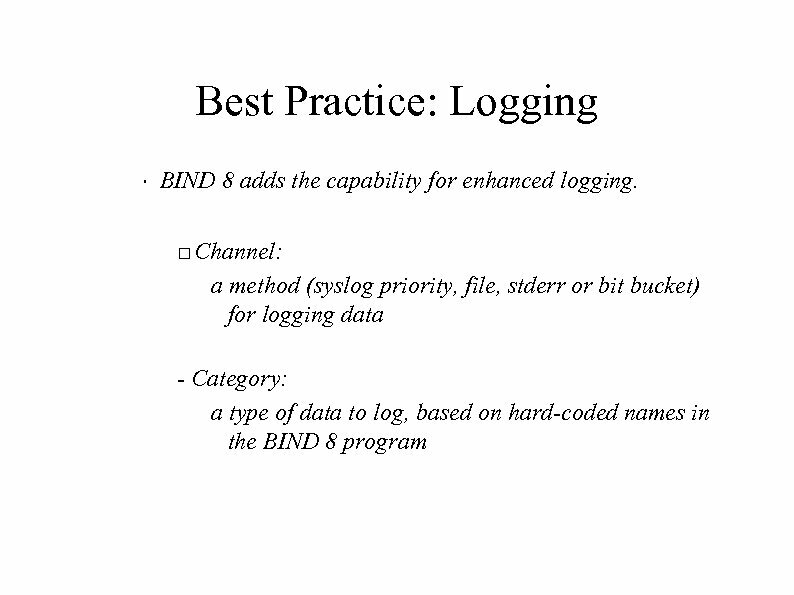 Much safer design than BIND -- break out functions into small programs with less privilege. Security 3/3? 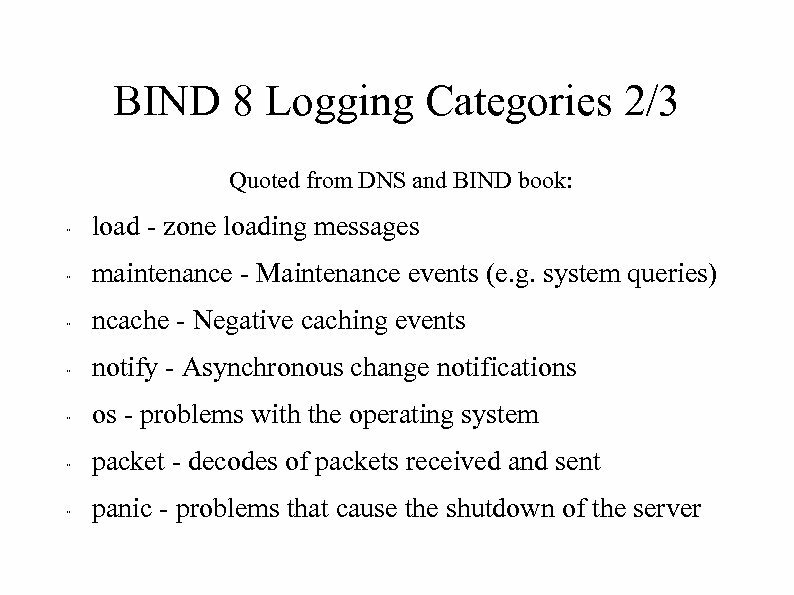 djbdns does much of what we do here very easily: 5) Queries for other people's domains are automatically restricted, since tinydns won't answer them -- this is the internal dnscache's job 6) It's darn easy, by design, to go split horizon with djbdns. Should You Use It? 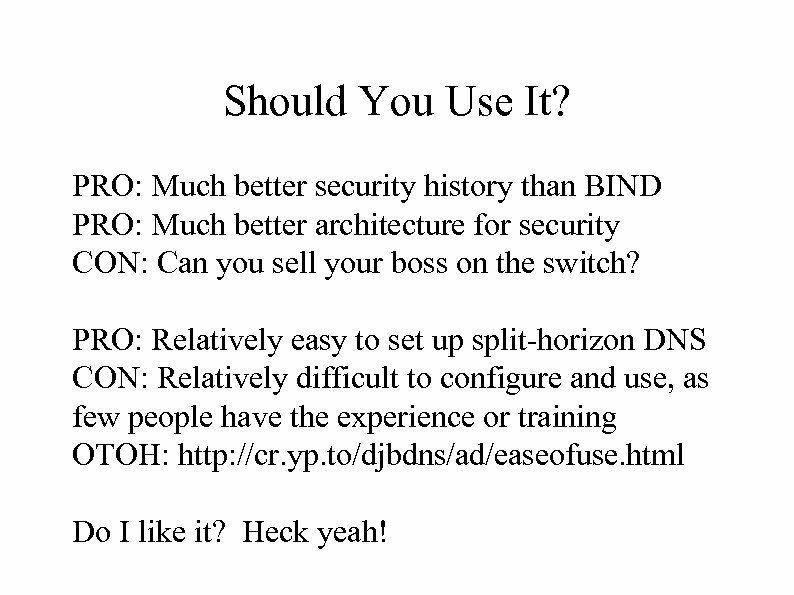 PRO: Much better security history than BIND PRO: Much better architecture for security CON: Can you sell your boss on the switch? 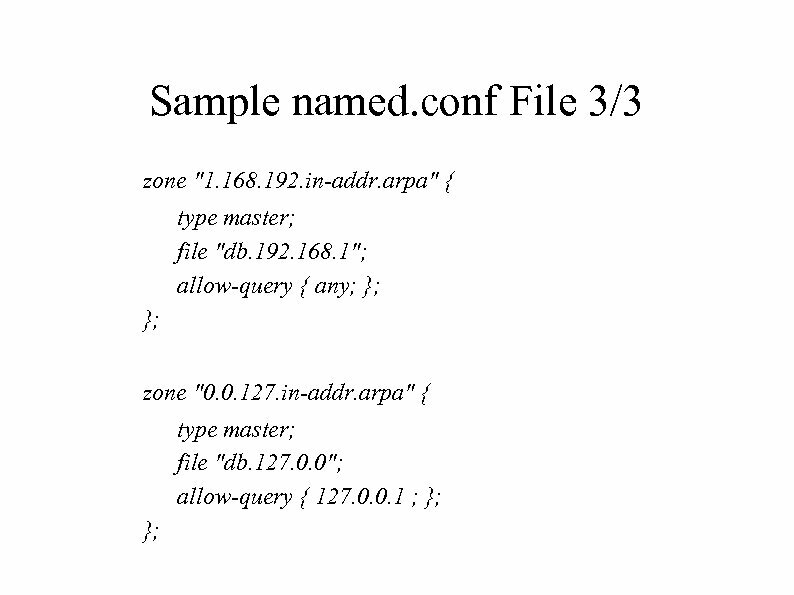 PRO: Relatively easy to set up split-horizon DNS CON: Relatively difficult to configure and use, as few people have the experience or training OTOH: http: //cr. yp. to/djbdns/ad/easeofuse. html Do I like it? Heck yeah! Wrap Up Go learn more about this stuff! DNS Servers are extremely important in maintaining the security of your organization. THINK about this one for a minute. 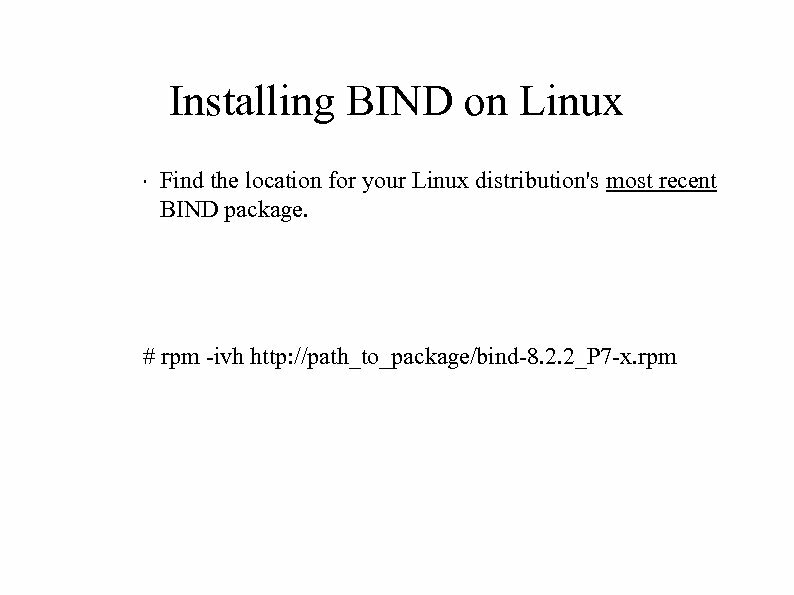 BIND vulnerabilities are coming out too quickly. . .